Readers will be aware of our Christmas Party on Sunday 7th December and our long outing to the New Forest in September next year. Booking forms for these have been circulated by email and post and should have reached all members. Please contact me if you have not received these forms and require them. In the last two years, our Christmas Party has been fully subscribed, so if you intend coming, please do not leave you booking until last minute – you might be disappointed. For next year’s long trip, we need to confirm numbers to the hotel by the end of December. We have currently booked the whole hotel. Tuesday 11th November, 8pm. A Hamlet in Hendon – the Church Terrace site from the Mesolithic to the 21st Century. Lecture by Jacqui Pearce. Jacqui is one of the principal authors of our latest book, and tutor of the HADAS Finds Group whose work over many years resulted in the publication of the 1973/74 excavations. Sunday 7th December, 12 noon – 4.30 pm (approx.) HADAS Christmas Party. Buffet lunch. Have you booked? It is with great sadness that we report the death of Jack. He died on the day before his 95th birthday. The funeral will be at Midday, 5th November, at Golders Green Crematorium. All welcome. The Obituary will be in the next Newsletter. HADAS’ new book “A Hamlet in Hendon” has been reviewed. He says “This beautifully written book is very easy to read. 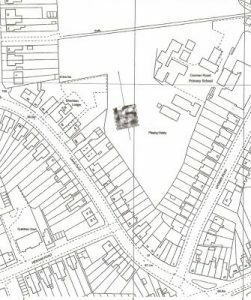 The site at Church Terrace, Hendon, was excavated by the Hendon and District Archaeology Society (HADAS) over two seasons during 1973 and 1974 and is close to St Mary’s Church, the Greyhound Inn and Church End Farm, previously excavated by HADAS. The HADAS finds group is to be congratulated for their perseverance and diligence in bringing this important site to publication. Church Terrace provided a stratigraphic record of a relatively undisturbed Greater London suburban site from prehistory through to the 20th century. This is important as we do not know what similar archaeology in the London suburbs was lost when local brickearth layers were systematically removed to make bricks for the expanding suburban housing estates. The first part of the book reads like a detective story as the authors explain what evidence from the original excavation is missing (or never obtained), and what can be reconstructed from the remaining records. The fascinating section that follows, based on documentary research (including maps, photographs and sale catalogues), establishes what structures had been located within the footprint. The authors bring the site to life by providing names for many of the occupants of the buildings described, and even the family connections between the occupants. The main part of the book provides a comprehensive interpretation of the finds, analysed by time periods from “Prehistoric and Roman” to “Georgian to the 20th century”. This extended format allows more interesting historical and manufacturing detail about many of the finds than is usually possible within specialist reports. The book is free to all HADAS members, so do collect your copy from Avenue House at one of our events: Lectures, Parties, Most Sunday mornings from 10.30 to 12.30 or from Don Cooper/Jim Nelhams see the details below. 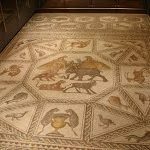 In 1996 work on a new road outside Lod, Israel uncovered a spectacular set of mosaics dating from the 3rd century A.D. Part of a Roman villa, the central mosaic is the largest and best preserved from anywhere in the Levant. This central section was lifted and preserved and is now a touring exhibition, supported by the Rothschild Foundation. The only place it visited in the UK was Waddesdon Manor, the country estate built by Baron Rothschild in Buckinghamshire outside Aylesbury in 1874, and bequeathed to the National Trust in 1957. The mosaic moves on to St. Petersburg in November. 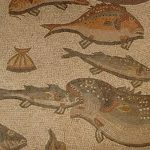 The mosaic unusually shows no people or gods, but a whole series of animals and fish, mostly as predators and prey. Many of the species of animals shown, such as giraffe and elephant, would have been unknown in the region, but the many varieties of fish were clearly identifiable. The exhibition also included a video of the work to preserve the mosaic in place, and then, scarily, to separate it from the underlying sub-strata, and roll it up for removal. Some of the plaster underlay was exhibited, with two footprints still visible from people who trod on it while it was still wet, one with a sandal and one barefoot. The artists’ line drawings and colour infills could also be seen in the plaster, showing the mosaic tessera-layers where to work. Site Code CRS14, TQ 25994 96482, May/June 2014. “Cromer Road School was built in 1932, it was built on farmland which was part of the Woodcock Estate. 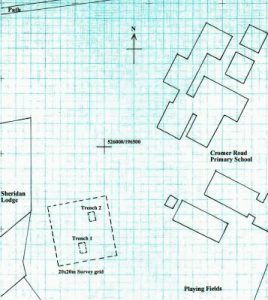 Maps show the current school field was a recreational area, and the footpath which ran across it has been rerouted. Cromer Road School is close to the site of an earlier school, which Cromer Road replaced. The old school is now occupied by flats. The Maw’s factory was built to the north of the Cromer Road School’s site and was open from 1920 to around 1980, when it was demolished and houses built there” (Sarah Dhanjal – Field School Handbook ). The project was primarily for the school children to learn some of the history of their area and get a feel for archaeological surveying and excavation – the school has recently had its 80th anniversary. The East Coast Main Line runs north – south approx 300m east of the school and was built in the 1850s. Most of the village of New Barnet dates from the establishment of the station there. Approximately ½ mile north of the school is Newmans Hill in Hadley Wood. There are remains of a circular earthwork here, thought to be of Iron-age origin. Just east of Newmans Hill is Livingstone Primary School, a development here found a substantial amount of medieval pottery. About a mile south-east is East Barnet village with known medieval occupation, and a mile or so west is the medieval settlement at Chipping Barnet, also with its association with the Battle of Barnet (1471). A 20m x 20m resistivity survey was undertaken to the west of the school’s playing field; although a series of high and low contrasts were seen the results were inconclusive. Two 3m x 2m trenches were laid-out over likely looking areas. This trench was used to give experience to and to teach the various groups of school children archaeological techniques and so did not go much below the topsoil layers. After deturfing the topsoil consisted of a dark loamy clay-based soil, including gravel with small to large occasional pebbles. This layer/context covered the whole of the trench to an excavated depth of 18cm (the turf was levelled at 65.24 OD). Below the topsoil layers a field-drain in clinker packing was found running east-west, part of a complex of drainage for the playing/ recreational field. This was indicated by the high resistivity results from the survey. The finds from the topsoil are typical from the mixed nature of these layers, including pottery – Post-Medieval Redwares 1650-1800 in date, Refined Whitewares (china) 1800-1900 in the form of sherds from plates, dishes and cups, and some Stoneware sherds 1700-1900. Building materials mostly small and fragmented – brick, roof tile and slate together with some corroded iron nails. There was a small amount of window glass together with some vessel glass both clear and coloured in nature – domestic vessels and beer/wines bottle etc. There were some clay tobacco stems. Other more modern finds included a hairclip and football boot stud (which caused some amusement with the school children). After deturfing the topsoil was very similar to that of Trench 1, below were lenses and spreads of gravel. Beneath the gravel was a silty/sandy clay layer  around 15cm thick. Under the clay was a packed pebble layer 10-15cm thick. The clay and pebble layer was cut by a field drain again, packed with clinker for protection. The drain ran east-west, it was made-up of 10cm dia ceramic pipe in 30cm lengths. At 50cm depth from the turf (65.24 OD) the sandy yellow/orange natural clay was found. Finds from Trench 2 were similar in nature to Trench 1 (above). More notable was a Post-Medieval Redware glazed ‘handle’ sherd, the handle would have fitted in a transverse manner and would have come from a substantial pot such as a storage vessel or garden container. Amongst the window and vessel glass finds was part of a medicinal bottle with measurement tabs on the side and a ‘paste’ jar base probably Victorian in date. Included in the clay-pipe tobacco items were two pipe-bowls, both with flat spurs and no other marks or decoration. They appear to date to around 1700-1770. An iron horseshoe was recovered (135mm x 120mm, bar 20mm x 9mm), another favourite with the young students. Other metal objects included a copper-alloy button 17mm in diameter. As can be seen the trenches show the mixed nature of the area with use as farm or pasture land from the Post-medieval period which could explain the Post-medieval pottery and clay-pipe finds. Then, with possible levelling and dumping layers e.g. the packed pebble, and clay with gravel spreads, these are cut by the east-west field drain complex dating from the Victorian to early 20th century period, creating the recreational area and later playing field. Aerial photographs show allotments encroaching very close to our trenches from the south – another source of disturbance. There was a persistent but small amount of brick, tile and glass, either brought in as dumping material or from earlier demolished building in the vicinity of the site. On the green opposite the school parch-marks indicate footings for a building constructed in the WWII period. The building was used for medical purposes and can also be seen in aerial photos. A resistivity survey was conducted here to show students a hands-on experience of the techniques we use to find buried features without digging them. Thanks to the Hadas members who took part, Sarah Dhanjal and UCL students, Susan Skedd (school history project), Helen Schmitz (Head of School) and other staff who helped. During our work at Cromer Road School this summer, somebody asked why we called one of our measuring instruments a “dumpy level”. Not knowing the answer, I looked for information about the instrument and its inventor. Step forward William Gravatt. William Gravatt was born in Gravesend in Kent on 14th July 1806. His father, a well-to-do Colonel of the Royal Engineers at Woolwich, was not a man to give his children an easy ride through life. He instilled in them the belief that they should look after themselves. His father suggested him as an apprentice to Bryan Donkin. Before completing his full apprenticeship with Mr Donkin, he gained employment with Isambard Kingdom Brunel who, “considered that he was a competent person to attend to the management of ‘the shield,’* in particular, and, in general, to the machinery belonging to the Thames Tunnel.” He was involved in an incident in the tunnel in 1827, when he was ordered by two directors of the project to take them into the tunnel by boat. In 1832 Gravatt became both a Fellow of the Royal Society and the Royal Astronomical Society, and in the proceedings of both Societies he took an active interest. Following the halting of work on the tunnel in 1832, Gravatt was, by the recommendation of his previous employer, Mr. Donkin, appointed Engineer to the Calder and Hebble Navigation. It was here that he commenced his first works, in the form of several river bridges, the arches of which were remarkable for their stability and cost effectiveness. The principle he adopted for their construction was the forerunner of the suspension bridge. Gravatt was commissioned by Mr. H. R. Palmer to examine the country for the original scheme of the London and Dover Railway. During the early period of railway construction he devised the level known as the ‘dumpy’ and also the ‘level-staff’ which is now universally employed, but which is not generally known to have been introduced by him. This enabled him to survey across valleys and across land to which he was denied access. He also designed a pocket-sized instrument, which he called a ‘nadir’. By using both the ‘nadir’ and a common box-sextant, it was possible to carry out surveys single handedly in areas where the lie of the land was prohibitively difficult or where the landowner may have had some opposition. He worked on several other railways and was responsible for the design and building of what was then the world’s largest space telescope, erected on Wandsworth Common. Gravatt died in Westminster on 30th May 1866 and was buried at the Church of St John of Jerusalem, South Hackney. Set in turquoise seas, Sicily owes its rich archaeological heritage to the importance of its strategic position and to its fertile lands. This small island, of nearly 10,000 sq. miles, has a captivating diverse landscape of mountains, valleys and coastal plains. It also bears the footprints of many civilizations: Greek, Roman, Arabic, Norman, Byzantine and Spanish. This legacy is reflected in the Sicilian language spoken by many Sicilians today—-a mixture of Greek, Latin, Spanish, Arabic and Norman French, incomprehensible to mainland Italians. It is also reflected in the monuments left behind by those who sought to exploit its military advantage and agricultural potential. There is evidence for early Palaeolithic and Neolithic settlements scattered across the island and in the 10th century BC, the Sicili tribe arrived and gave its name to the island. But the greatest catalyst for change came with the arrival of the Greeks in 734BC. They landed on the eastern coast where they constructed a city-settlement in a sheltered bay near accessible water sources and within sight of Mount Etna. Giardini Naxos is an early example of deliberate town planning. The site is now an archaeological park: there is a small museum housing finds from digs; an interesting collection including pottery, stone and terracotta artefacts, vases, lamps, large jars and sacred vessels. The park itself is extensive. It feels like a tranquil orchard with orange and lemon trees—-a legacy of the Arabs—- walnut and olive trees, cactuses and oleanders, cypresses and mulberry trees. There is scattered evidence of building foundations, roads, walls and fragments of temples, furnaces and altars but no information and only a few signs. After a while, we turned back in the midday sun and missed, so I understand, a long 500 meter wall and 2 ancient pottery kilns at the far end of the park. It was sad to see ancient features so overgrown and badly maintained. I asked whether archaeologists were currently working on the site. I was told they came occasionally on Mondays! There was evidence of later fortifications and irrigation systems but the most exciting feature of the site was its ancient history and the fact that nothing had been built on most of the area in modern times. The city was destroyed in the 5th century BC and its citizens sent elsewhere to be slaves. This, indirectly, led to the development of Taormina on a nearby hillside. It is now a charming, medieval town with narrow, winding, stepped streets and pastel coloured old houses, palaces and churches set high over the sea. It has a stunning, breathtaking Greek theatre located close to the cliff edge where plays and opera are still staged. Although it was built by the Greeks in the 3rd century BC it was later rebuilt in brick by the Romans on the same site in the first century BC. The surrounding wall still stands and columns with capitals are in evidence. The proscenium arches and back wall are also still there —unusual in ancient theatres. With the backdrop of Mount Etna on one side and the sea on the other—both visible from inside the theatre, it was easy to imagine the wonder and excitement of long ago plays being performed. Syracuse, on the southern side of Sicily, was once the most important city in the Western world. At the beginning of the 5th century BC, it began to grow and expand and became a crucial trading centre under Greek influence and many of its grandest monuments are from this period. In 211 BC. it fell to the Romans in spite of the ingenious devices invented by Archimedes for its defence. He was subsequently hacked to death by the Romans. Later, it became an early centre of Christianity and briefly a capital when the Byzantine Emperor moved his court here in 663 AD. After that, it went into decline and played little part in the medieval conquests by Arabs, the Norman French and the Spanish. Nevertheless, it is a kaleidoscope of archaeological and architectural styles spanning many centuries. We visited the Archaeological Park at Syracuse which is an amazing treasure chest of monuments. There is a 5th century BC theatre overlooking the harbour which, after later modifications, could seat 15,000 people by Roman times and an amphitheatre for gladiatorial combat which is the second largest to be found in the world. It was elliptical in shape with inscriptions still extant and a small tank in the middle of the arena for draining away blood. An enormous altar at the entrance was built in the 3rd century for a temple for Zeus: 450 bulls were slaughtered there at the same time. Further up the hill, there is an artificial waterfall and grotto fed by an ancient aqueduct and there is evidence of tombs. The quarries which provided most of the stone doubled up as prisons at one time. The most famous is Dionysius Ear—so named by the Italian painter Caravaggio— an immense cavern, which housed political prisoners. It was said that the emperor Dionysius could listen outside and hear what the prisoners were plotting because of the peculiar acoustics of this very tall cave. We had a go at singing Land of Hope and Glory to try out the echoes but it wasn’t as effective as a group of German tourists who had a much louder delivery! We also visited Ortigia, a part of Syracuse, which had been the initial settlement area because of its island status and natural harbours. A few remaining columns and fragments of wall from the Doric Temple of Apollo were visible and date from 565BC.Close by is the Piazza Duomo which is a very attractive square. The cathedral which dominates it is a wonderful mixture of historical styles. It incorporates the body of a glorious temple from the 6th century BC which had doors of ivory and gold and painted scenes of battles long gone, Byzantine elements from when it became the first Christian cathedral and a Norman facade built after the earthquake in 1693. Baroque decoration was also added. We saw other cathedrals, notably at Monreale, where the mosaics were sumptuous and shimmering and in Palermo at the Palatine Chapel which was also completely covered in amazing mosaics and had an unusual honeycombed wooden ceiling. These were both examples of Norman architecture and art. We also visited the dramatic site at Segesta. It had been a large 5th century city but the only visible remains were a lovely theatre high on a hillside and, a few kilometres away, a well preserved temple. Maintenance was evident at the temple and excavations are ongoing so perhaps more evidence will be added in time. However, the undoubted highlight of the holiday was our visit to the Roman villa at Casale (Three km from Piazza Armerina) This was located nearer the centre of Sicily in rolling hilly countryside and felt very remote. It is believed to be a 4th century hunting lodge built by emperors Maximian and Diocletian for summer use. It was later abandoned and buried by a landslide in the 12th century. The mud covering helped to preserve the mosaics of this luxury villa for 800 years. More like a palace, it has been designated a UNESCO World Heritage Site on account of its scale, size and incredible mosaics. Excavations began in the 1950s and are continuing. It has been roofed for preservation and walkways allow the visitor to see the mosaics in full. The villa is built on terraces and at the entrance is a complex bath house with latrines and a courtyard. The main part of the house also has a courtyard with rooms off. 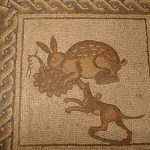 Everywhere there are pavement mosaics: mythological scenes, pictures of wild animals from Africa—lions, elephants, rhinos, hippos, ostriches etc—and their capture and transportation to Rome, hunting scenes, flora and fauna, birds, domestic pictures e.g. 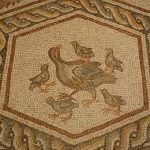 of a family going to the baths with their slaves .The detail and narrative of some of these scenes are spectacular, particularly in the animal mosaics and the hunting story and help us to understand more about Roman life among the rich and powerful. These mosaics were examples of very advanced mosaic art and are thought to be the work of North African artists. The walls and columns were also painted and some evidence of this survives. There is also a basilica with a marble floor which was used as a reception room and several private family rooms. One very unusual mosaic is of ten women exercising in bikinis—not just a 1960s invention then! It is thought that this was the exercise room of the lady of the house as the women depicted were all respectable (seemingly you can tell by their hairstyles as married women put their hair up). Many of the activities shown, such as discus and running are represented here and are still part of the Olympic Games. They are thought to be taking part in a Pentathlon competition. The winner has a laurel crown. Agrigento or Valley of the Temples is another unmissable sight. Built on a ridge overlooking the sea, the ruins of several Doric temples show up on the skyline to dramatic effect. A good harbour and fertile land encouraged the development of this area in the 5th and 6th centuries BC. Some of the city walls still exist with hollowed out sections for tombs, and ancient olive trees, several thousand years old, grow within a romantic, ruined landscape. There are the ruins of 4 main temples .Firstly, the temple of Hercules which has 9 columns remaining and is dedicated to a demi-god rather than a more important one .Traces of the white stucco which covered the temples can still be seen here. In contrast, the second temple of Concordia is well preserved and the most complete, probably because it was converted to a Christian church in the 6th century. It is fenced off, however, so you need to circle it to admire its tapering columns. Thirdly, the Temple of Juno, half in ruins. shows evidence of fire damage. A mammoth pile of rubble denotes the fourth temple: the Temple of Jove /Zeus, the largest Doric temple ever built or partly built. Left in ruins by the Carthaginians, it was also brought down by earthquakes and stone robbing. Intriguingly, the toppled body of a massive stone giant—8 metres high— lies in the middle on the ground. It would have been upright in the temple, acting as a column. I understand all these temples are lit up at night; it must be a fabulous sight ! We were also interested to learn that an English gentleman, Alexander Hardcastle, went out to Agrigento after the Boer war and excavated parts of temples, roads and walls. He was trying to find a theatre but did not find it. In the end, he lost all the family fortune and died in an asylum in 1933. His house is still there, though, and is now used for administrative purposes for archaeology. Cefalu was our last port of call: a delightful fishing village with long sandy beaches. Caught between a wall of rock and the sea, it boasts a magnificent medieval cathedral (1131) where later baroque decorations have been stripped off to reveal Byzantine style mosaics. High above the altar is the figure of Christ Pantocrator with his long face and powerful eyes. In the town, we looked for the famed Arab wash house but walking around and down steep lanes leading to the sea, we missed it! And had a coffee instead! Beautiful Sicily! We felt we only had quick tasters of the historical and archaeological treasures it had to offer and its magnificent landscape of valleys, mountains and sea. I hope to return. The HADAS visit was on a beautiful still summer day. Views of France, the outline of Dover and Pevensey could clearly be seen. The journey to the top, although 167 steps, is far from onerous as there are many places to sit and rest but I am not sure how many HADAS members braved the climb. My sister and I are always full of admiration for the determination of some of our amazing frail customers who can and do make it to the viewing gallery and think nothing of it. It is stunning to see, from the viewing gallery, the 360 degree panoramic views over Romney Marsh to Appledore, uncountable 500 odd shingle ridges (each the product of a major storm), Marconi’s experimental station, the old keeper’s accommodation together with the sprinkling of old railways coaches transformed into homes, mixed in with the original fishermen’s cottages and WWII buildings that form the Dungeness community today, made famous by Derek Jarman’s garden book. We also like watching the light railway train puffing along the track on its way from Romney Station. It is, however, humbling to think that the Lighthouse was the last view of Britain so many local agricultural workers and their families, unloaded under the Poor Laws of the mid 19th century, ever saw on their way to Australia from embarkation at Gravesend. Dungeness has seen a succession of five lighthouses dating from the first 17th Century wooden bonfire type situated near the sewer outfall behind the Power Station, the second next to the old Coastguard Cottages, the third 18th century stone building which once stood in the centre of the Lighthouse keeper’s roundhouse accommodation next to the Old (fourth) Lighthouse and the final fifth Lighthouse built near the water’s edge, locally referred to as “the stalk” due to its modern construction. The most important feature of The Old Lighthouse is the Great Lens lit by an incandescent mantle into which paraffin oil was vaporized by the use of compressed air. This enabled the light to shine out for 18 miles and was at the time of build, considered more efficient than electricity. However, briefly towards 1959 the electric light bulb was used as it had become acceptably efficient. The Lens, however, still remained clockwork and had to be wound every 24 hours! 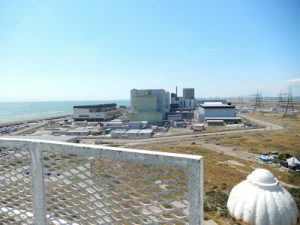 Dungeness has its own climate due to the fact that it has constantly grown outwards into the English Channel because of reverse long shore drift and strong currents driving the pebble beach to prograde some 6 metres a year in some parts. In Roman times the shore was nearer Lydd, thus Dungeness is very much a medieval landscape. Standing close to the late 18th century waterline The Old Lighthouse was decommissioned in 1960 due the construction of the Nuclear Power Station directly due south blocking the beam from the Great Lens and sector lights which, in respect of the former, then needed to be seen 20 miles out to sea. The redundant fourth Lighthouse was sold by Trinity House to the Dungeness Estate but later came into my family by chance in the summer of 1983. My father James Stanners bought it at the suggestion of his friend, James Godden, the local fairground operator, when he accompanied the latter to a London Auction where the Lighthouse had been put up for sale along with a selection of local authority assets. After my parent’s death the intervention of my late husband ensured that The Old Lighthouse remained in family hands. 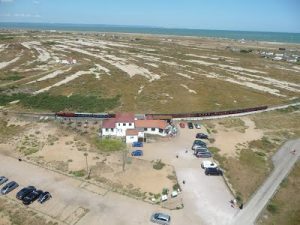 The top of the lighthouse provided excellent views of the power station, and also the loop on the railway track, where the Romney Hythe and Dymchurch Railway turns for its return trip towards New Romney and further destinations, and of our train waiting to take us. View from the top of the lighthouse towards the Romney Hythe and Dymchurch Railway and towards the Dungerness Power station. Thursday 20th November, 7.30pm, Camden History Society, Camden Local Studies Centre, Holborn Library, 32-8 Theobalds Rd. WC1X 8PA. Evelyn Wrench’s Postcards of the Early 1900s. By Peter Blackman. Thursday 20th November, 8.15pm. Hampstead Scientific Society, Crypt room, St John’s Church, Church Row NW3. The Post Office Railway. Talk by Chris Taft. Wednesday 26th November, 7.45pm, Friern Barnet and District Local History Society, North Middx. Golf Club, The Manor House, Friern Barnet Lane, N20 0NL. Victorian Xmas Cards, Talk by David Green, Visitors £2. Friday 5th December, 7.30pm, Wembley History Society, English Martyrs’ Hall, Chalkhill Rd, Wembley HA9 9EW (top of Blackbird Hill). Kensal Green Cemetery. Talk by Henry Vivian- Neal. Visitors £2. Tuesday 9th December, 6.30pm. LAMAS, Clore Learning Centre, Museum of London, London Wall, ECY 5HN. The Gentle Authors’ Magic Lantern Show of LAMAS Slides. Glass slides taken by members of LAMAS more than a century ago. Visitors £2. Tuesday 9th December, 7.45pm, Amateur Geological Society, the Parlour, St Margaret’s Church, Victoria Ave. N31BD. A History of Life in 10 Fossils. Talk by Dr Paul Taylor (Natural History Museum). Wednesday 10th December 7.45pm Hornsey Historical Society, Union Church Hall, Ferme Park Rd. Weston Park N8 9PX. Bounds Green, A Fascinating Corner of Haringey. Albert Pinching. Visitors £3. N.B. The 12th November talk is changed to The Crocus King- EA Bowles of Myddleton House, by Bryan Hewitt. Thursday 11th December, 7.30pm. Camden History Society, Burgh House, New End Sq. NW3 1LT. The West End in the 1800s, Emerging Pleasure District. Talk by Dr Rohan McWilliam. Visitors £1.Wine and mince pies from 7pm. Wednesday 13th December, 2.30pm. Mill Hill Historical Society, Trinity Church, The Broadway NW7. John Lewis, 150 Years in Retailing. Judy Faraday. Friday12th December, 6.30pm. Friends of the Petrie Museum, UCL Lecture Theatre, Institute of Archaeology, 31-34 Gordon Sq. The Ancient Egyptian Demonology Project. Talk by Kasia Szpakowska. ALSO Saturday 13th December, Study Day, Secrets Revealed, Artists and Epigraphers in Egypt. Tel 020 76792369. Email janpixton@injet.demon.co.uk.